Click on any product below to view information. Advanced. Versatile. High Sensitivity. Our lineup of laboratory thermal testing equipment includes the family of Hot Disk TPS systems plus the Thermtest HFM-100 Heat Flow Meter. 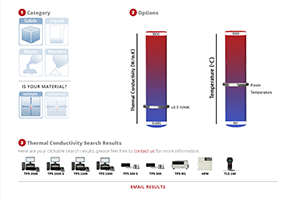 Click on any of the models above to view more information or click one of the three options below to help you choose the right thermal conductivity equipment and method for your testing needs. Thermtest manufactures laboratory instruments and supply accessories that provide ideal solutions to different industries such as industrial, academia, environmental, government labs, engineering and many more. Thermtest continues to upgrade thermal conductivity instruments to meet the testing needs of their customers. There are a number of possible ways measuring thermal conductivity, each of them are suitable for a limited range of materials, depending on the thermal properties and temperature. The Heat Flow Meter method is an easy-to-use rapid technique for thermal conductivity and thermal resistance measurement of insulation materials, building materials, packaging, and assemblies. The thermal conductivity measurement system includes Hot Disk TPS, Heat Flow Meter, Transient Hot Wire and Transient Line Source systems. The flagship Transient Plane Source TPS 3500 offers the highest accuracy for transient measurement of absolute thermal conductivity, thermal diffusivity, and specific heat. The Transient Plane Source TPS 2500 S constitutes a proven industry benchmark for absolute measurement of thermal conductivity, thermal diffusivity, and specific heat. The Transient Plane Source TPS 2200 represents a scaled down transient measurement of absolute thermal conductivity, thermal diffusivity, and specific heat. The Transient Plane Source TPS 1500 is designed for measurement of thermal transport properties of low to mid-thermal conductivity materials, such as insulation and construction materials. The Transient Plane Source TPS 500 S offers excellent value for measurement of absolute thermal conductivity, thermal diffusivity, and specific heat. The entry-level Transient Plane Source TPS 500 for transient measurement of absolute thermal conductivity, thermal diffusivity, and specific heat. The Thermtest HFM is a steady-state method of measuring thermal conductivity of insulation and construction materials. With two flux sensors and exact temperature control, results are rapid and accurate. Purchasing a thermal conductivity testing system can be complex. 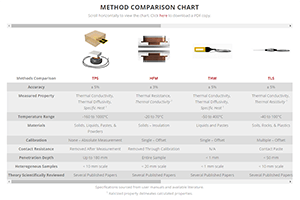 Thermtest has simplified things with Product Compare, Product Finder, and Method Comparison. If you still have questions regarding which product is right for you, please don't hesitate to request a demonstrations or contact us. An easy to use side-by-side comparison. 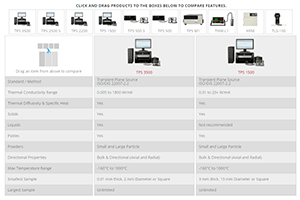 Click and drag products to the boxes below to compare features. Select a material, set your options by dragging the silver ring, then click on an image in section 3 to view a match. A convenient list to quickly compare specifications of 8 methods. Scroll horizontally to view the chart or download a PDF copy. Browse the Frequently Asked Questions page for more product information. If you still have questions, feel free to contact us at anytime. We are here to help. Explore the thermal properties of a diverse set of thermal conductivity applications. Click on a method below to view applications or click here to view all thermal conductivity applications.